Join the Community Celebration to formally Welcome and Celebrate Clinton Pryor’s amazing journey, Walk for Justice, on Sunday 3rd September. Long walk for justice: ‘Spiritual Walker’ Clinton Pryor walked across the country for his people. After almost a year and 5,580kms, Clinton’s Walk for Justice is reaching its final destination…Canberra. CALL OUT FOR VOLUNTEERS to best support this community event and carry out a huge variety of tasks or even just 1 task for 1 hour between 7 – 4pm. If you can volunteer in any way including helping with setting up, packing up, or with tasks during the day then please email Selina Walker, from the United Ngunnawal Elders Council (UNEC). Selina will liase with you and will book you into a time and job slot that would best suit you. Selina is also requesting that any support community groups, who wish to hold a stall at this community celebration to make contact with her directly to arrange please. 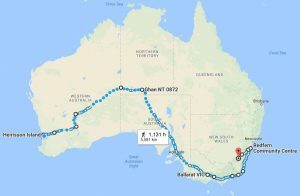 Donations can continue to be made to Clinton and the team at www.gofundme.com/clintonswalk.